I recently set out to listen to the entire Robots-Empire-Foundation series from start to finish. 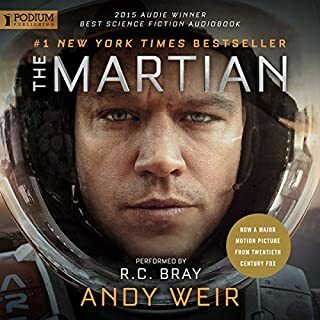 Fortunately, Audible has added to the list of available titles. 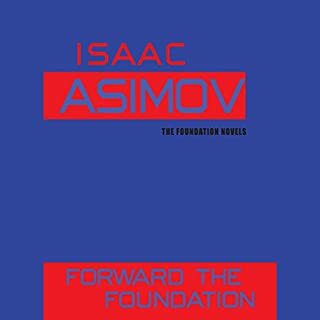 Asimov did a great job - decades later - of inserting this title as a jumping off point into the classic Foundation Trilogy. The narrator is decidedly the low point. He reads it as if he were reading to third graders. Also reminds me of the old joke about the letter home: "I am writing slowly, as I know you read slowly... ." I used the iOS Audible app to move the speed up to 1.25x normal. This made the pace tolerable. Emilio Sandoz is a remarkable man, a living saint and Jesuit priest who undergoes an experience so harrowing and profound that it makes him question the existence of God. This experience - the first contact between human beings and intelligent extraterrestrial life - begins with a small mistake and ends in a horrible catastrophe. This was a very frustrating story. It's hard to go into much more without risking spoilers. The premise is an intriguing take on first contact stories; but it gets detoured into a crisis of faith. And veeerrryy sllloooowww to get going. Be prepared to persevere. 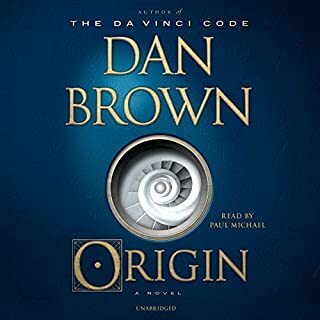 Did Dan Brown suddenly take writing lessons from George RR Martin? I like Brown and avidly read DVC, A&amp;D, even Lost Symbol. Honestly, passages of this book felt like he needed to add 20 pages here and there. The narrator made the pace worse through those sections. I appreciate the history of art and architecture, but the pace of the story suffered for the descriptive density. Here's hoping for the next one. 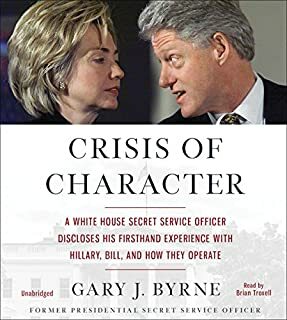 Byrne served as a uniformed Secret Service officer on post in the White House during the first Clinton administration. While there are many accounts of actual events, a third of the book involves his testimony to the investigation led by Ken Starr. They put Byrne through the wringer. The balance is largely about his subsequent career as a federal air marshal. Not what I expected based on the title of the book. They began as close allies and friends of FDR, but the quest to shape a new Constitution led them to competition and sometimes outright warfare. 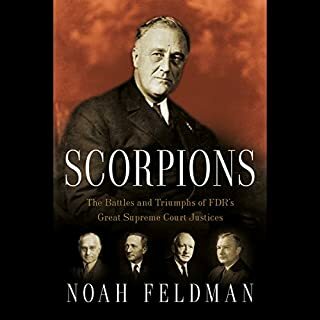 Scorpions tells the story of four great justices: their relationship with Roosevelt, with each other, and with the turbulent world of the Great Depression, World War II, and the Cold War. It also serves as a history of the modern Constitution itself. This is a fascinating journey through the history of 20th century American jurisprudence. Listeners will learn how FDR met Felix Frankfurter, Hugo Black, Robert Jackson and William O. Douglas in the course of his political career. Those four men set the Court on a path that changed the law -- before they even became justices. Great history lessons here. Very approachable; law degree not required. 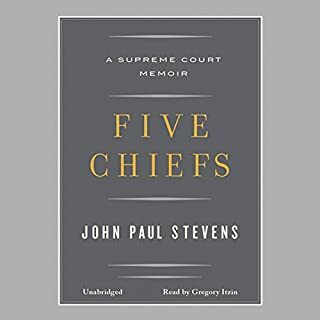 In Five Chiefs, Justice Stevens captures the inner workings of the Supreme Court via his personal experiences with the five Chief Justices - Fred Vinson, Earl Warren, Warren Burger, William Rehnquist, and John Roberts - that he interacted with. 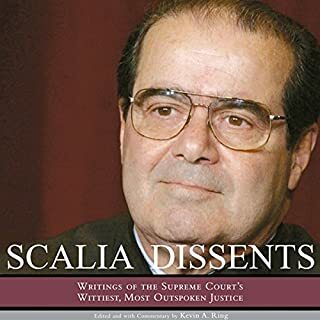 He reminisces of being a law clerk during Vinson's tenure; a practicing lawyer for Warren; a circuit judge and junior justice for Burger; a contemporary colleague of Rehnquist; and a colleague of current Chief Justice John Roberts. Too much "you should've done it my way." What did you like best about Five Chiefs? What did you like least? Anecdotes about the inner workings of the court and its insular membership are always enlightening. The book has a disappointing "what a good man was I" tone. Still, Justice Stevens place in history is safe. The narrator was a bright spot. He probably did not attempt to mimic the Justice, but the timber of his voice was pleasantly familiar and appropriate. It was almost as Stevens might have read it aloud himself. Brilliant. Colorful. Visionary. Tenacious. Witty. Since his appointment to the Supreme Court in 1986, Associate Justice Antonin Scalia has been described as all of these things, and for good reason. As a lawyer, I appreciate a well written opinion. Justice Scalia rarely disappoints in print. The selected opinions are substantive and far reaching. The editor(s?) did a fair job of trying to create context since the main opinions are not part of the recording. This will be a difficult listen if you are new to legal procedure and terminology. Would you be willing to try another one of Wyntner Woody’s performances? I'm not sure whether to fault the director or the narrator for the performance quality. Vocal range and tempo are important when reading heavily structured material aloud. This performance was uneven and inconsistent. The speed and pitch frequently changed in mid-paragraph. I often struggled to keep listening. Was Scalia Dissents worth the listening time? The Justice was psychic. It's eerie how often his warnings about problems with the Supreme Court's decisions become reality. It is a good window into how appellate constitutional law works, and why normal people are frustrated with the legal system. In 2004, as Pope John Paul II's reign enters its twilight, a mysterious exhibit is under construction at the Vatican Museums. A week before it is scheduled to open, its curator is murdered at a clandestine meeting on the outskirts of Rome. The same night a violent break-in rocks the home of the curator's research partner, Father Alex Andreou, a Greek Catholic priest who lives inside the Vatican with his five-year-old son. 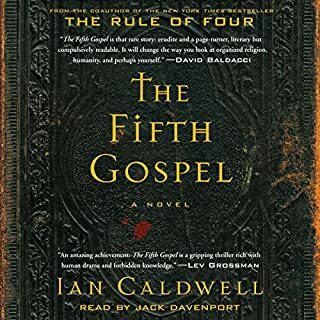 The author uses the Vatican and an ancient manuscript as a backdrop for a deep story exploring the tension between three generations of a family stretched between two churches in a test of faith. Good story telling. Definitely not meant to be a Dan Brown style screenplay; more of a playwright. High marks for the narrator as well. 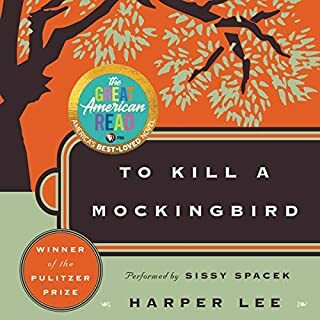 If you grew up in a small southern town, this book resonates in many ways. 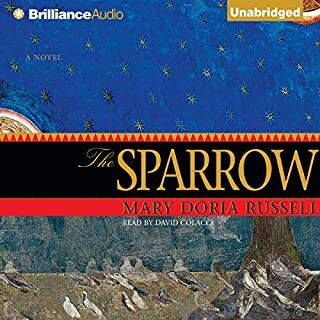 Sissy Spacek's narration makes it worth another listen regardless of how many times you've read, heard or seen this work performed. Brava. How would you survive stranded alone on Mars? Imagine waking up alone on Mars and figuring out how to survive with tools and equipment meant for a 31 day mission. No aliens or mystical forces come to save the day. I consider it a paean to human ingenuity and that just won't quit spirit. The narrator made the hero come alive. It was easy to believe you heard the thoughts and words of a stranded man, with a great touch of humor.